It's hard to believe that Ken Scholes' Lamentation is a first novel. It lacks the rough edges of apprenticeship and resonates with sure-footed and exciting story-telling. Set in a post-apocalyptic future, this fantasy with science-fictional elements (or is it science fiction with fantastical elements?) is the first volume in The Psalms of Isaak quintet. The second volume, Canticle, was released by Tor this month. The prose in Canticle, like that in Lamentation, is vivid and precise, crystalline and muscular, minimalist and true. 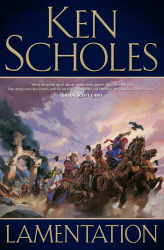 Line by line, Scholes' prose arrests the reader and shoves her forward. 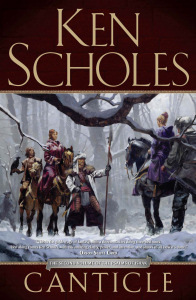 "I [enjoy] the thrill of finding the story and painting it with words," said Scholes. "In novels, I like having the space to explore the story from different angles, experience different characters. I write by ear and listen for words that sound right. I do like to capture people and then move them forward with the scenes and characters and words. I particularly like writing to a challenge — some of my best stories came from challenges." As Scholes explains below, The Psalms of Isaak started with a challenge (in the form of a dare presented by his friend and his wife) and continues to challenge him personally and professionally. Scholes is currently working on the draft of Antiphon, the third volume of The Psalms of Isaak. Legend has it that you made the jump from short stories to novels on a dare? How is writing novels different than writing short fiction? Do you feel more or less at home in the novel form? Yes. It was a dare from my close pal Jay [Lake] and my wife Jen. They convinced me to write Lamentation on September 11, 2006 and I went home that night to start the book. Until then, I envisioned a series of four connected short stories. Jay promised that if I had a rough draft, he'd help me get introduced around at World Fantasy at the end of October. Jen told me she'd cover my share of the household responsibilities if I'd write the book in that seven weeks. It took a dare because, frankly, I was afraid of the long form and pretty sure I would need to take a long stretch of time and write several novels before I had anything publishable. Until Lamentation, my longest completed piece was 15,000 words. I underestimated how well my short story writing skills would transfer over. Jay suspected that if I wrote fast, I'd keep ahead of that fear and get out of my own way. He was right. I don't know that any of us suspected that the first novel would do so well. The biggest difference in novels for me is scope. It takes far more time and energy and the story is so big it can't be held completely in my head. With short stories, I can knock something out in three or four days and have them to market in under a week. Novels take a bit longer for the first draft — about five months if I'm writing at a comfortable clip of 1k per day — plus revision, copyedits, galley proofs. I wouldn't say I'm at home in novels yet. I'm getting there. I think I'll know more about that after I finish the series and get on to the next project. The Psalms of Isaak grew out of the short story, "Of Metal Men and Scarlet Thread and Dancing with the Sunrise". What was it about that particular story that begged (or allowed) for more? At the time that I wrote it, nothing really stood out. I had some working notes I ran across later that said I'd like to come back to Rudolfo and write more about him. But really, I didn't see more to "Of Metal Men and Scarlet Thread and Dancing with the Sunrise" until I saw Allen Douglas's art for the story. When I saw that image of the metal man weeping in the impact crater, I realized there was much more to Isaak than I'd known and much more to his story. Your fiction, long and short, is rich with dark humor. What role does humor play in your fiction? How does it affect pacing, character development, world-building, etc.? Humor plays an important role in my life — the dark kind as well as the lighter. Sometimes it carries over into the fiction but when it does, it shows up organically and I really don't think about it much. It just becomes a part of the point-of-view of whoever my narrator is in that particular story. It colors their observation of events in their world and becomes a part of their voice, usually effortlessly. What does a post-apocalyptic setting allow you to do that a non-apocalyptic fantasy setting doesn't? Looking back over my body of work, surviving apocalypse is a recurring theme. Certainly, there are some personal reasons for that buried in my somewhat dark childhood. In The Psalms of Isaak particularly, I wanted to try something a little different. A lot of fantasies are about saving the world from a coming apocalypse; I wanted to write one about the descendent survivors of one and what their society would be like. This lets me explore how the world was broken, what the forces were that broke it, what it takes to rebuild it and how that rebuilding can go awry. And it lets me explore what right and wrong look like in a society of survivors. Can you map the creation and development of one of your characters? That largely happens organically. I really don't think about specifics initially. I start with a person. I think about what they are afraid of and what they hope for, then I introduce them into circumstances that force them to face what they're afraid of in order to attain what they hope for. Sometimes along the way, they get what they want and then threatening what they've attained becomes the springboard for their next bit of growth as they then face new fears (or old ones) and stand or fall based on how they handle that new conflict. Sometimes, they lose what they have and are changed by that. If I'm outlining, I'll often start with the fears and hopes and then as I write, introduce them to circumstances and conflict to see how their hopes and fears play out through it. As I write the characters, how they face things — and how other characters either help or hinder them — will often advise me on what's coming next in their development. I always try to have external conflict prompting internal growth. I actually think that's how life works, too. Do you usually write from an outline or by the seat of your pants? I write both ways. Lamentation was by the seat of my pants. I had the first short story at the front end and the second short story at the other end. I had a handful of characters — Rudolfo, Sethbert, Jin Li Tam, Isaak and Petronus — with little detail of what happened between the two stories other than a war that Rudolfo somehow won. When I wrote Canticle I had an outline but truth-be-told, I never looked at it after I wrote it and closed the file. 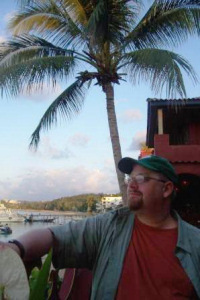 I just distilled down the story to a size that fit in my head and then took off though I did have the structure of the story — how many chapters, how many scenes per character, what they feared and hoped for and sometimes, I'd lay down a sentence about what needed to happen in a future scene if I knew it. Antiphon went more like Lamentation with no outline, just a few scribbled notes. This project was originally just a standalone short story. Then, after seeing the artwork, I conceived of four short stories, interconnected and spread out over a period of time. But when the second story didn't stand alone well enough for Realms of Fantasy (and when the editor, Shawna McCarthy, suggested I go write a novel) I started thinking maybe this was a novel. Still, because of that fear I mentioned before, I didn't think I could pull it off until I finally took Jay and Jen's dare that night over tater-tots. At that point, I thought I had a trilogy but after finishing Lamentation and letting it sit, I realized it was five volumes. The most important thing I've learned from Lamentation is that whether or not I'm conscious of it, I can write an effective novel. I'm still not clear exactly on how I do it or what makes it all work. But the process has taught me to follow my instinctive ear for story even when I'm uncertain. And with Canticle and Antiphon I learned a lot about how life can intersect and interfere. Losing my parents (one during each book) was a painful experience but I learned how grief impacts my writing process. And writing Antiphon through Jen's rather challenging pregnancy taught me a bit about fortitude. Next up, learning to write with infant twins! The Psalms of Isaak definitely evolved and will continue evolving. And I'm laying the groundwork to spend a lot more time in this world both in the mythology and history of its past and in its future. What part of a novel takes the longest and/or presents you with the most challenges? Drafting the novel takes the longest for me though "long" is relative — I think the last two books took about six months of actual writing time. My biggest challenge is the lack of trust in myself. Those days when the right words feel wrong. I lean heavily on my first readers and some of them even pace me by reading along as I write, chapter by chapter, so that I'm getting a constant stream of reassurance that the story is on track and moving in the right direction at the right speed. My best cheerleader is a co-worker in my day job, Jerry, who devours each chapter and even charts my productivity on his wall calendar. I think the second greatest challenge is not knowing what to do next. Every once in a while, I'll hit a wall and I won't know it until I've written a thousand or so words in the wrong direction. If I can't figure it out within a day or two, I'll brainstorm it out or verbally process it with Jerry or my other close friend, John. The middle chapters of Lamentation seem to accelerate an already fast-paced story. How do you go beyond simply keeping the middle from dragging and, instead, making them exceed what comes before? I honestly don't know how I do it. I just lay down the words that seem right at the time. But I do think the structure I've chosen helps this — keeping the scenes short and like snapshots from my character's lives was intended to keep the reader moving forward quickly. As for the endgame... what isn't the end of a novel? What doesn't a novel's conclusion do? And how do you balance an individual novel's ending with the needs of the series as a whole? This is a tricky question because I think different people will have different answers. For me, I want to see that the characters have changed as a result of the external and internal conflicts they've faced and that they've gained or lost something as a result of it all. I want to give readers enough that they feel they have some answers but I want those answers to raise more questions — sorta like how life works. With the series, because it's truly one big story and not five smaller ones, I try to find a good ledge to stop on for a little breather. There's a balance between offering satisfaction and creating a strong desire to see what happens next. During revision, are you an adder or a cutter? I'm an adder mostly apart from cutting a few sentences or changing words here and there. With Lamentation, I needed to add two chapters. With Canticle, I needed to add a scene. I'm not sure yet on Antiphon, but this may be the first one where I don't need to add other than bits of clarification along the way. My process is pretty simple. I take the comments from my first readers and my editor, I merge it into one document and then I go through it, reading it myself, and either accepting or rejecting their changes, tweaking and polishing as I go. I take one pass through at that stage and then a second pass during the copyedit stage. If there's time, I read the book and take my own notes but these days, there isn't time and I'm finding that I can read and revise as I go just as effectively. Well, after Requiem and Hymn [the final volumes of The Psalms of Isaak], I have a small but fun project I can't quite announce yet but I'm eager to tackle it. Beyond that, I'm hoping Tor will want to let me tackle a short series based on my short story "Invisible Empire of Ascending Light." I'm also planning to propose a new series and some standalones set in the world of The Psalms of Isaak. I have high hopes of tackling a YA trilogy with Jay at some point and I want to tackle a more traditional epic fantasy without the robots and science fictional elements. And more important than all of that: I want to enjoy my new daughters. Ideally, the hard work now — and the popularity of the series so far — will eventually lead to me writing full time so that I can have a bit more balance in my life and more time with my family while increasing my writing output.